Panchakki, the Hindi translation of water mill, was used in earlier times to grind grains for the pilgrims. It was built using the scientific concepts of the medieval Indian Architecture. It was designed to pull down water energy from a mountain spring. This building is attached to the dargah of Baba Shah Musafir, a sufi saint and in a garden near Mahmud Darwaza. This place has a mosque, madra, kacheri, minister’s house, a sarai and houses for zananas. 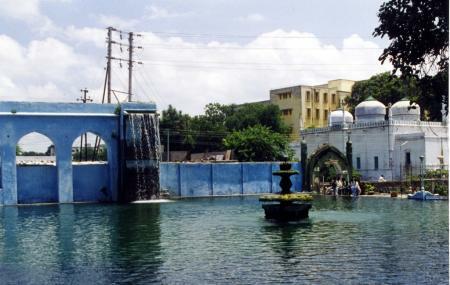 Most of the buildings here including the Panchakki were erected by Turktaz Khan. This mill is kept full of water through pipes from the Harsul River. There is a cistern made in such a way that water is bound to fall in the mill here. The mosque base here forms the roof of a hall with fountains also formed from this water and the excess water is made to run into the Kham River. This hall is a cool and beautiful place which is extensively used as a resting place for pilgrims during summers especially. A lovely view of the Kham River can be enjoyed from this hall. This hall has a cenotaph dedicated to the Saint Baba Shah Musafir and also a tomb of Baba Shah Mahmood. There is also a huge banyan tree to make the view even more charming and the mill still moves without any manual effort. This is one of the most picturesque venues of the country with the Kaula Nala on one side with two lovely bridges in a layered pattern and the Shah Musafir’s garden on the other side and one of the important tourist attractions around Aurangabad apart from Aurangabad caves, Daulatabad Fort and Ellora Caves. Recent additions to this place are the opening of the center and the museum library with manuscripts and other precious books that have been opened here after centuries. There are books on various subjects such as history, law, medicine, Sufism, religion and philosophy in Arabic in Urdu and Persian languages. It is an ideal place for photography. The best time to visit is during the winters or monsoon because of the pleasant weather. The nearest railway station is the Aurangabad railway station. You can reach it by autorickshaw or taxi from Aurangabad. By Bus: Ghati Bus Stop is the nearest bus station. People normally club together History Museum and Siddharth Garden while planning their visit to Panchakki.